As a world leading name in digital signage, NEC displays are installed in some of the most challenging and highly visited locations and venues across the world. Meeting rooms are evolving into multi-usage spaces. NEC’s InfinityBoard is designed to fit your meeting scenario, whilst perfectly fulfilling your needs for a powerful and scalable workspace. Presenting, brainstorming, reviewing, video conferencing or collaborating; whatever the objectives of your meeting, the NEC InfinityBoard presents a perfect fit modular solution to achieve your desired meeting environment. Designed on the Ultra-High Definition (UHD) InGlassTM touch displays, it comes with stylus pens and wireless presenting functionality. The powerful Slot-In PC is based on the industry leading Open Pluggable Standard (OPS) interface - granting you flexibility for future upgrades. The Windows 10 IoT Enterprise platform is ready to run all of your business software and tools. 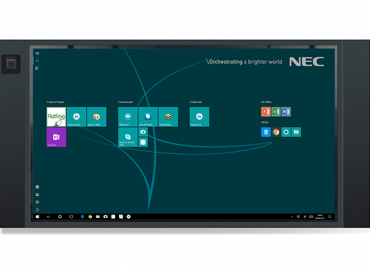 NEC InfinityBoard, infinite possibilities to facilitate collaboration, drive productivity and keep employees attentive and motivated. InfinityBoard Series - 65 & 84"
You’re searching for that big idea but it’s elusive on the concept paper. It’s bigger than that, it needs freedom to develop, to break new ground with the swipe of a finger. Let your creativity run free with InfinityBoard, experience flexible handling combined with precise responsiveness for infinite project success. With powerful potential, ideas are eager to flourish, but it’s often within a team that ideas are nurtured to fulfillment. We know that skill sharing brings synergistic advantages, where working together creates new perspectives. Open your borders and draw on a wider talent pool with InfinityBoard, and benefit from infinite collaboration. Communicating an idea and demonstrating expertise is best achieved in cohesion with the senses, using sound and visual elements to convey and convince. Experience the power of infinite persuasion as InfinityBoard places the tools to success at your fingertips, where quality speaks volumes.